Hookedblog recently shared some images of a Vhils piece (covered here) tucked away down a side street just off Bethnal Green Road (the station end) on the exterior wall of the Bethnal Green Nature Reserve. The piece was created for the Phytology* Project, a research base project launched by Nomad in association with Cape Farewell and the Teesdale & Hollybush TRA. 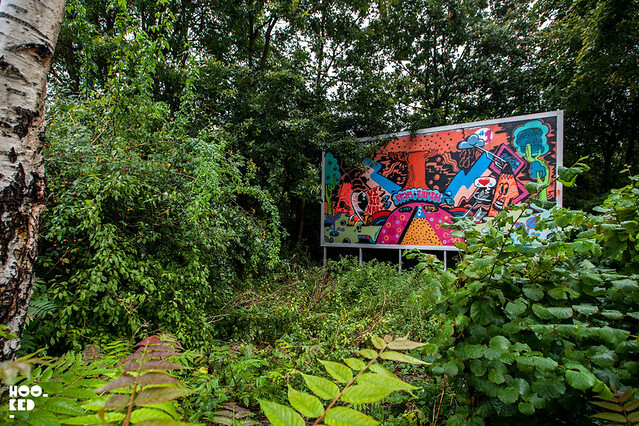 The Vhils work was one in a series of year-long artist commissions taking place in the Reserve. 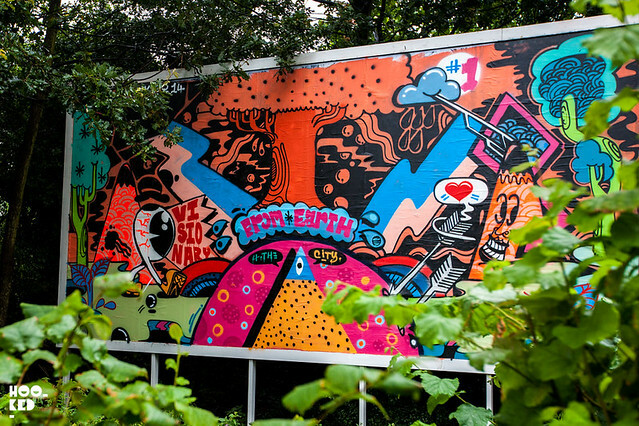 The latest commission for the project saw Sickboy redecorate a billboard over the weekend with a site specific piece of work for the project. The vibrant piece in the artists signature style and colour palette really pops against the backdrop of the plants and trees in the nature reserve. The Phytology and the Bethnal Green Nature Reserve is set to close for the year on August 30th, 2014 but the project will continue on their digital platforms throughout the Autumn and Winter months. The Vhils piece is located on the exterior street wall and no appointment is needed to see it. The Sickboy billboard is just about visible from the street. For addition information on the project, the thirty-two species of wild plants they have sown and the upcoming planned event and commissions visit the Phytology website. In other Sickboy news, there is less than a week to catch the artist's excellent 'Make It Last Forever' exhibition currently on display at the Outsiders Gallery in Soho, London until the 30th August. You can check our coverage of the exhibition on the blog here or go and see it in person if you are in London. We've also been pinning some of our favourite Sickboy pieces both outdoor and indoor work onto our dedicated Sickboy Pinterest Board go have a look at some of the artists other work.